A drill originally developed to work in the low-gravity environment of Mars will help retrieve Antarctic bedrock samples with the aim of understanding the continent’s climate history. 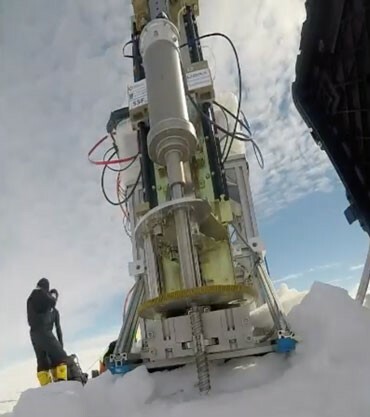 Researchers from the University of Glasgow in Scotland took a modified version of the Martian drill to Antarctica, where it will be deployed to retrieve rock samples from the bottom of a 651-meter deep ice borehole completed by researchers with the British Antarctic Survey. Samples of the Antarctic bedrock will be analyzed for radioactive isotopes, which could help determine how long ice has covered the area of the borehole location, and provide clues to Antarctica’s and Earth’s past climate. The drill was originally designed to work on Mars, where the lower gravity impedes the application of enough force to bore into hard rock. The Glasgow engineers overcame this problem by using ultrasonic vibration to kick the drill into motion, creating a back-and-forth, oscillatory movement that hammers the drill bit into the ground. The device’s small size and ability to work nearly autonomously allow drilling into the bedrock at the bottom of a deep ice borehole without the logistical challenge of shipping a large drilling rig to remote areas. Since Earth’s gravity is stronger than that of Mars, the team had to repurpose the drill and remove the ultrasonic component, which otherwise might have stalled due to increased hammer forces. Someday, the original drill could be used to retrieve Martian rock samples. This entry was posted in Science News and tagged rocks, samples on 2019-01-18 by Linda Chappell.